LCR Embedded Systems offers our customers a state-of-the-art manufacturing facility located in the United States, with a full suite of assembly, manufacturing, integration, and testing capabilities – and the most significant advantage we offer is our people – highly trained, highly motivated staff who understand your mission, your product and its specifications, and the challenges that it is designed to overcome. Assembly techniques include J-standard Class 3 soldering, and high-end cable harness and electromechanical assembly. 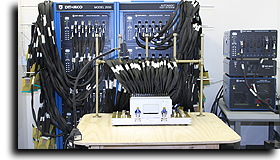 Test capabilities include full backplane testing and electrical and full functional testing. We also have hundreds of well-defined formal processes in place covering every aspect of manufacture, assembly, and testing to ensure uniformity and repeatability in our products. Over the last decade, we have also developed a world-class network of suppliers that enable us to handle special requests. As part of our commitment to Continuous Improvement, LCR Embedded Systems has integrated the concept into its formal company structure, with the philosophy that nothing is done that does not add value. Whether your project can be characterized as build-to-spec or build-to-print, LCR Embedded Systems will turn it into reality.